This EKG comes courtesy of Dr. Podlog, Dr. Zhi, and Dr. S. Hassan. 1. What does EKG A demonstrate? 2. What does EKGB demonstrate? EKG A shows a 2:1 AV block with a ventricular rate of 40. EKG B shows a 3rd degree AV block. The patient should have a pacemaker placed. The patient presented with dizziness and SOB and was found to be bradycardic. The EKG helps elucidate the type of bradycardia. EKG a shows bradycardia with the presence of P waves but some dropped P waves. This can occur in 2nd degree or 3rd degree AV block. 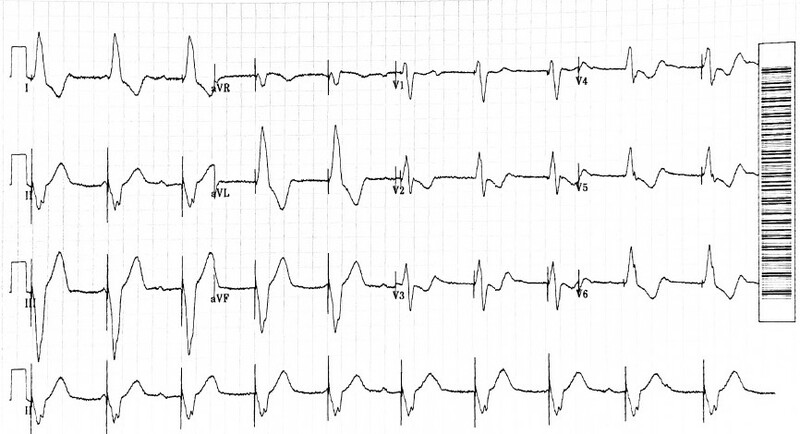 On EKG A, it appears that some P waves are followed by QRS complexes and others are not. This is consistent with 2nd degree AV block. Every 2nd P wave is dropped, so we can not tell if it is 2nd degree type I or 2nd degree type II. However, on the repeat EKG, there appears to be no relationship between the P waves and the QRS complexes. The R-R intervals are regular and the PR intervals are irregular. This is consistent with 3rd degree AV block. Patients with 2nd degree AV block can progress to 3rd degree AV block. Close monitoring is essential. Also, running a loner rhythm strip or frequently repeating the EKG can be helpful to allow you to identify higher grade AV block. Patients with symptomatic 3rd degree AV block require pacing. Prehospital, these patients should be treated with transcutaneous pacing. In the hospital, a transvenous pacemaker should be placed.